Learning all the ins and outs of your medical insurance can seem overwhelming, but it’s essential. In fact, the decisions you make about medical insurance and medical treatment can significantly impact the quality of your life - now and long into the future. Cut Through the Confusion on Health Insurance and Medical bills will help you evaluate your health insurance options and choose the best for your family and you. It will also guide you on how to handle your medical bills once they arrive. 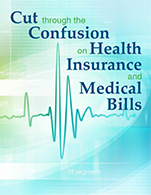 Cut Through the Confusion on Health Insurance and Medical bills will help you understand health insurance terms. Learn how to calculate the best insurance plan for you and your family. Learn how to create your health insurance summary card. Learn how to review your medical bills and make an appeal to your insurance company. Learn what to do if you cannot pay your medical bill in full. Learn what to do if your medical bill is turned over to collections. Learn ways to keep your medical expenses to a minimum. GREAT COMBINATION OF ALL YOUR CONSUMER EDUCATION MATERIALS. I learned so much from this program I don't know where to begin. It's so simple to follow along. Just what I needed.